Watermelon is one of the the most favorite fruits in the summer. She is real refreshment in the hot summer days. Watermelon has only 30 calories in 100g. Watermelon contains over 90% water, very little protein and 10% fruit sugar. Also contains carotenoids, vitamin B -- group and vitamin C.
From the minerals contains potassium, magnesium, phosphorus, calcium, zinc, iron and copper. It is a good source of beta carotene and lycopene. Watermelon is very healthy fruit and is especially useful for the kidneys. Favorably affect the work of the digestive organs and supports the excretion of fluid and toxins from the body. Cutting the watermelon is not a science, but classic pieces are not exactly the most practical when you want to serve to more people. Find out how you could you make small, practical sticks of watermelon in a very short time. First cut the watermelon in half and remove the peel and white parts. 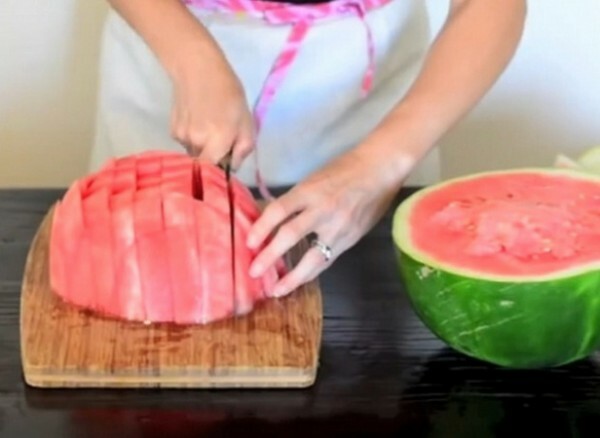 Then cut the watermelon in slices, in width-wise and length-wise. Finally put the watermelon in bowl and serve.